Lynn had talked about a set of nice props he got from an online hobby store. Those are the props in question. $55 bucks each seems pretty reasonable for a 32 inch carbon fibre prop. I think I might buy a set, my plane currently has biplane props but I just cant believe they are the best option based on how they came about and the newer developments that have occured in the last 30 years. Here is an interesting report on the Rotax 185. The torque and HP curves are much flatter than I had been lead to believe. Man I'd just stick with the Bi-props or use some P-tips or Clarks. No RC prop will ever be on my engines. Have you flown a Lazair yet ? wow nice find on the rotax 185 report by the national research centre (NRC canada). did you notice they ran their 185 at 7000rpm for part of the test? did they add a turbo with intercooler?????????? so all you green lazairheads better line up for some wildfire catalytic converters eh! Shannon wrote: Man I'd just stick with the Bi-props or use some P-tips or Clarks. 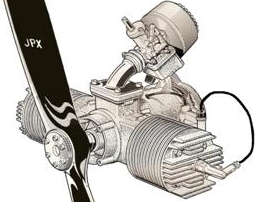 No RC prop will ever be on my engines. Have you flown a Lazair yet ? The lazair I have has some very tired looking biplane props on it. I plan to do quite of bit of running of these engines and props on the ground before flying it.